First things first… I forgot to write on the wings that they’re meant to be pasted to the back of the doll. My bad… Sorry. Secondly, Happy Veteran’s Day. One of these days, I will remember this holiday far enough in advance to do something thematic. Still, I think Veteran’s day is one of the more important US holidays, so I want to thank any of members or former members of our armed services today. Meanwhile, I’ve had several requests for fairies over the years. I’ve never done one, except for a Halloween set where I did a fairy costume, but other than that I haven’t done many fairy paper dolls. It’s a rather out of season. I seem to think of flowers and gardens in the summer when they bloom, but I live in Alabama now where the flowers cling on long after the normal times that flowers are supposed to bloom. Oh, there are some pixie paper dolls which fairy themes, now that I think of it. I did Fleur, Belladonna and Flora. Of course, I suppose having done 3.5 of them is not a bad statistic over the years. Anyway, feel free to comment on the printable paper doll if you wish. I’m pretty pleased at how she came out. Secondly, Check out the new layout. It is still in progress and I’m still messing with it a fair bit, but I have high hopes for eventual success with it. What happened was that I updated my version of WordPress and updated my old theme. Well.. that messed up the formatting and I decided that the right thing to do was finally bite the bullet and redo the entire thing. So, the blog looked schizophrenic for a few days while I tried out new and different themes. Right now, the theme is Mantra and I can only say good things about it. I judge a theme on how much of the CSS I have to rewrite myself and with Mantra the answer has been… shockingly little. Just a few small tweaks to the code. All in all, a very nice and clean theme. Anyway, I’m not sure how I feel about the new layout, so feel free to comment and tell me what you think. 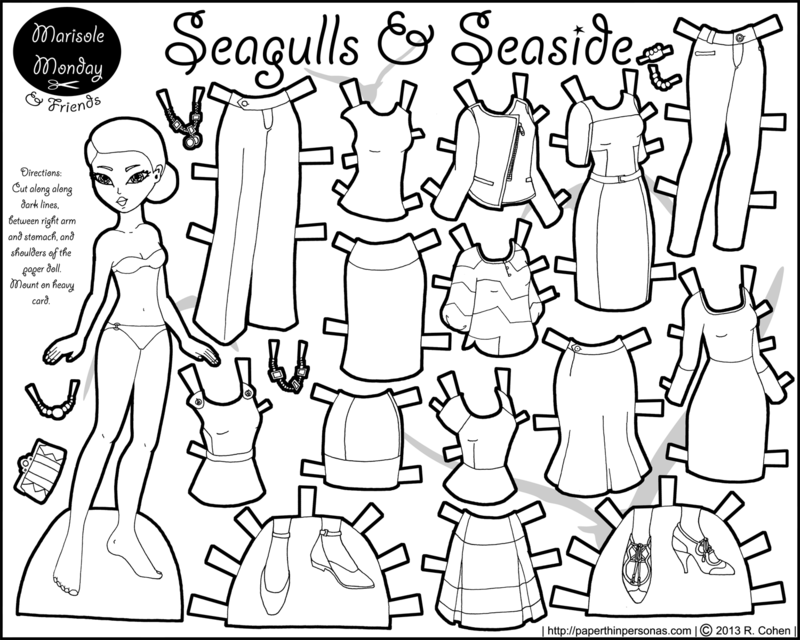 As for today’s printable paper dolls… I’m posting some more previously colored Marisole’s in black and white. I think they look charming. They’re all very modern though some of them are two years old. 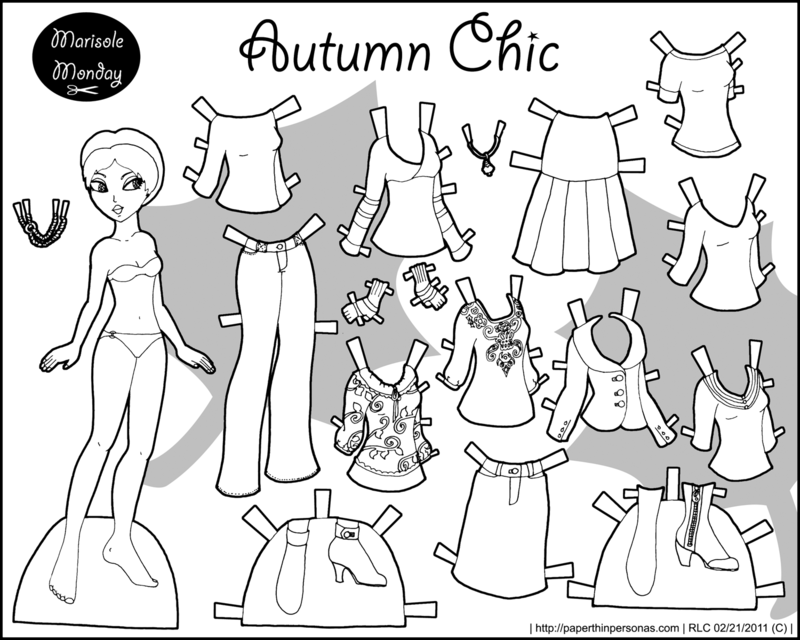 Well, I did a series of seasonal paper dolls- or at least I thought seriously about it- and this one was for Autumn. You can see the Autumn Chic in color and I forgot to give her a background pattern, though I’ve fixed that in my black and white version. Paper dolls without backgrounds just look so sad and empty to me. Being someone who loves alliteration, I called this paper doll set Candy Coated Couture, which made more sense when she was full color. I think she’s a great example of the importance of mixing neutrals into a colorful scheme to increase mix and match clothing options. Plus did I mention that I love most of her clothing? Now that she’s available in black and white and I think she’s just as cute. So, now Mia is getting into the act. Here she is off to prom or maybe some sort of red carpet event. I never wear an evening gown in the real world, but paper dolls aren’t meant for the real world, are they? Enchanting Evening in full color is another paper doll where I forgot to put in a background image. It bothers me, though not enough to fix it. I should really fix the apstorphe in Streets of China first… that’s the one that really gets to me. Anyway, let me know what you think of the new theme and check back later this week. There will be another update. I’m not sure when yet… but it is going to happen. Summer is still in full swing here in Alabama. It rains in the evenings and afternoons and I miss the cool crisp air of the coast where I grew up. People are saying this is a freakishly cool summer here and all I can think is that when it’s not a freakishly cool summer, how horrible that will be. Anyway… Mia is here today showing off some summer fashions pulled from the pages of a few different magazines. Ever since I started posting these paper dolls in black and white as well as in full color, I’ve had more trouble naming them. I used to use the colors as a fall back for lack of naming ideas, but now… there’s not much for it. Let me be clear: When it comes to Victorians, the coolest thing to me is the idea of changing your clothing for several times a day. Also, getting to put together a trousseau before you get married. Is it wrong that I love the idea of not having to think too hard about what I would wear for a year? Anyway, today’s paper doll is a riff on that whole concept. I love reading through old fashion magazines to find out what was proper to wear for a carriage ride or afternoon tea. As a child, I loved the idea of having special outfits for riding or hiking or going for a walk. It felt exotic and fancy. My original idea was to do a bride and her trousseau inspired by the Victorian inspired styled I love so much. I always think of this as a chance to draw Victorian inspired fantasy clothing with no guilt about lack of historical authenticity. I realized, after I started that I wasn’t sure I wanted to draw that many items, so instead focused on a smaller set of “bathing place” costumes for Mia. Basically, Mia’s off to the coast for a vacation and she’s gotta be dressed appropriately. So, there’s a yachting costume, a traveling suit with an alternate dinner bodice and a swim suit with slippers to match. All in all, she can handle a weekend in on the coast rather well, I think. Not the most cheerful color scheme ever developed for a paper doll. I almost made it all black, but that seemed a bit much, even for Gothic Marisole. If you look closely, you’ll see one of my usual tricks for keeping things from looking totally “flat” is to use shades of the same color. So while everything is “black” there is still some definition between the various parts of the garments. I actually did this Marisole in four shades of very very dark grey which look black, but still allow the line work to be seen. how long have you been drawing paper dolls for? To answer the easiest question, I have been drawing paper dolls for as long as I can really remember. It began when my mother would draw me a doll as a bribe for cleaning my room or other activity and then I had to draw the clothing. Eventually, that evolved into drawing my own paper dolls, though I still prefer clothing to the dolls. As for your requests, I have added them to my list of ideas. I usually keep a running list of ideas, but since most paper dolls are drawn weeks (sometimes months) before they eventually get posted, I can’t promise anything as far as doing any of those ideas. And I probably won’t to the ballerina, because tutu’s scare me. To answer a related question, Tawny asked: What is your favorite sort of paper doll to draw? I mean… I think eeery thing you do is great, but what do you like to do the most? I like drawing everything. I do find I tend to return to certain themes a lot. I like things that are a little alt-fashion inspired and a little fantasy inspired. I often draw from fashion magazines, because it makes deciding what to draw simpler. I always fear that I will fall into a rut and draw the same thing over and over again. I try to keep things interesting using reference images and other materials. Got a question you want me to answer on the blog?Ask me here.